Tyson Gay clocked the fastest time in the world this year in a blistering run, despite a cold and a negative headwind to win the 100m at the London Diamond League meeting at Crystal Palace yesterday (August 13, 2010). The 2007 triple world champion had a wonderful lead from the start and cross the line in 9.78 against a field without two monsters Usain Bolt and Asafa Powell both were out due to back injuries. Bolt's training partner Yohan Blake of Jamaica was second in 9.89, while the Olympic silver medalist Richard Thompson of Trinidad and Tobago third in 10.05. Yohan Blake's time is a new personal best and also the fourth fastest time in Jamaica behind Usain Bolt (9.58), Asafa Powell (9.72) and the Nesta Carter's 9.86 seconds set at Switzerland a few days ago. A week ago, at the Diamond League meet in Stockholm, Tyson Gay ran 9.84 to upset the world and Olympic champion Usain Bolt who had previously held the world's leading time together with Powell at 9.82. 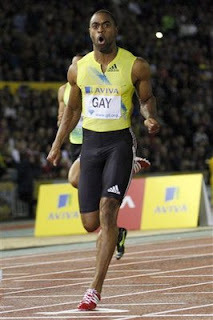 Tyson Gay, who coached by Lance Brauman and Jon Drummond, however admitted he was not in the best shape and had a little sore at his groin prior the race but he was determined not to let it undermine his performance. He drove on superbly and finished the race as a great warrior!